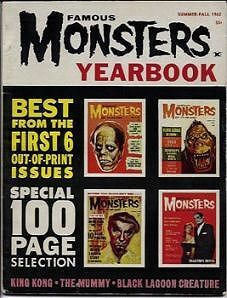 Rare first yearbook of Famous Monsters in beautiful condition. Cover features four earlier covers of FM. Inside articles are reprints from the first six issues. If you've never been able to afford those first six issues of Famous Monsters, here's the next best thing. FM # 1 only had limited distribution, but if you lived in the New York City or Philadelphia area at the time, you would have been able to buy a copy at the newstand. Website design and hosting by Sohodojo Business Services. Item 161 of 466 items displayed in viewer. 0 items in cart.